The Indiana Chamber’s “Indiana Employment Forms” presents the latest HR-related forms. 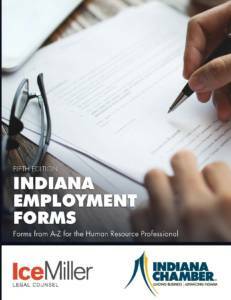 Authored by a team of attorneys from Ice Miller LLP, this popular publication provides a comprehensive collection of more than 120 human resource forms and letters for Indiana employers, ranging from the interviewing process to discipline and discharge procedures. Anyone interested in keeping their company in compliance!